The Cuban Government has encouraged for more than half a century an economy of dependency that requires the freebies and subsidies of other countries for their Poverty and misery is evident all over the countrylivelihood, while the country barely manages to produce a fraction of the net proceeds achieved during the Republican era and the people subsist on poverty wages averaging less than one dollar per day. The following report has been drafted in Cuba by journalists who are constantly harassed and often jailed. The new "Economic Society of Enemies of the Country"
While in Havana the irrational silence of the dictatorship continued on the specific causes that provoked the air tragedy of May 18, and at a time that the heavy rains from tropical storm Alberto devastated homes and flooded thousands of hectares of crops, the new “President” Miguel Diaz-Canel decided to leave the disaster behind to go with his wife to Venezuela in support of dictator Nicolás Maduro. And the latter, mocking his own people who are now hungry and without medication, sent thousands of cans of tuna, mattresses and other equipment to the island for those affected by the storm Alberto, thus unleashing a wave of condemnation of Maduro by the Venezuelans. For his part, the president of the country that right now is massively intervening in Venezuela, accused Washington for his “attempts” to intervene in that country. At that very moment, a plane with 100 Venezuelan high officers landed in Cuba to receive training on how to repress their compatriots and how to avoid a military uprising against Maduro who, in turn, have been arresting hundreds of officers while thousands of enlisted men are resigning or defecting from the armed forces. The silence of the Cuban government, owner of Cubana Airlines and therefore responsible to all the families of the deceased for hiring a plane which crashed due to its terrible technical condition, became a public affront when the dictator left his hiding place throughout the these tragic days on May 31 and went to the José Martí airport to receive Diaz-Canel and his wife on their return from Caracas. By doing this Raúl Castró clearly showed his contempt for Cubans, because he had no qualms about knowing that his vanishing act and silence about the air tragedy and the destruction caused by the floods had nothing to do with health impediments, but with his cowardice and inability to face difficult situations. According to preliminary assessments, the rains partially or totally collapsed more than 1,000 homes. 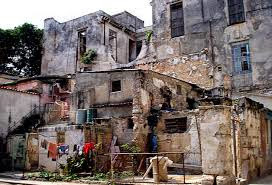 Only in Havana 100 homes and buildings that were in poor condition collapsed. You could add these numbers to the inventory of thousands of homes destroyed by Irma in 2017, which is still a pending problem without solution. If that were not enough, the floods caused by Alberto has devastated crops, thus worsening the already serious food at a time when the country does not have foreign currency to import – as it does every year – 80% of national food consumption. In the midst of this national tragedy, the leaders of the PCC in Guantanamo come to boast that they have “creatively” solved the destruction of the last Hurricane Irma with the construction of houses with palm planks. These houses were built in pre-modern Cuban rural areas by poor peasants. The expectation in 1959 was that the revolutionary process would have replace them with safe and comfortable houses. Those now raised are “ready” only to be devastated by the next hurricane that hits that region of the island. The great floods destroyed bridges, roads, interrupted the transportation of cargo and passengers, flooded thousands of hectares of crops with the consequent aggravation of the food crisis, and gave the sugar harvest a shot in the head. If before tropical storm Alberto –which never hit Cuba directly- the production of sugar was going to be the lowest since the early twentieth century, now everything indicates that in 2018 the harvest will be the worst in the history of Cuba after its independence. During the 19th century, despite the War of Independence of the Ten Years, sugar production grew notably in Cuba, increasing almost five times since 1850 (223,145 Spanish long tons) to 1894 (1,054,214 tons). Experts estimate that by 2018 this 21st century will produce just 1.1 million tons, almost exactly the same tonnage of 1894, a year before Martí and Gómez disembarked at Playita de Cajobabo to start the second war of independence from Spain. Houses made of palm wood boards, an island with suspended national air service, where only 5% of the houses have a 24 hour running water service supply, a sugarcane harvest equivalent to the previous year of our second war of independence. These are very appropriate “achievements of the 1959 revolution” to be remember in the now near commemoration of the 60th anniversary of the establishment of communist power in Cuba. As antipodes of the founders in the XVIII century of the prestigious and innovative Economic Society of Friends of the Country, the current Cuban power elite power of the XXI century has become a mafia society of enemies of the country that has declared war on popular welfare and national progress.